Various Industrial Rubber Seals like polyurethane seals, cast polyurethane seals, cast polyurethane seals and flex resistance polyurethane seals from Different types of Polyurethane, X-NBR and one of our indigenous materials. Our in-house material can reduce your seal by 50%. Ask us how. 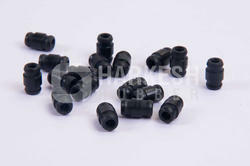 Molded Rubber Goods offered is made available in different material options of silicone, EPDM, NR, and others.